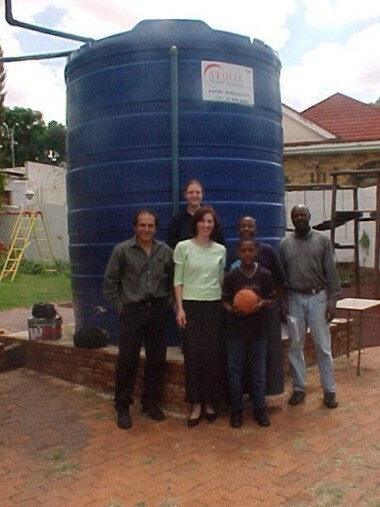 Veolia Water has given the Johannesburg School for Blind, Low Vision and Multiple Disability Children a 15000 litre tank to gather rainwater. This is used to reduce water bills at the school and to teach the children the value of conservation in a water-short country. In parts of South Africa, crops fail due to drought and many jobs in the agricultural sector are lost. This has been a major problem in the Western Cape recently. Water is vital for all sub Saharan Africans. The school runs two holiday weeks a year. These are combined with burns camps for Children of Fire, the charity which runs the school and provides the major part of the pupil intake. Camps make learning fun. The photograph was taken on March 24th 2005, during the pre-Easter holiday week. It was also the second day of water awareness activities run by the school in association with the Department of Water Affairs and Forestry (DWAF). Veolia Water Systems, a wholly owned subsidiary of the French multinational Veolia Environnement, is a world leader in the design and manufacture of water and waste water treatment equipment and systems and related services. It also manufactures and supplies the full range of speciality water treatment chemicals. The South African entity has been in operation for the past 31 years. It has built up a wide range of clients from various industries, including the food and beverage, automotive, pulp and paper and mining markets. People in the picture include Penny Burrows, Tino da Silva and Johanes Magagule from Veolia, Amelia Tandy the school manager, and Phindile Mzizi from DWAF.